The strangest afternoon I’ve spent in theatre in years. So, a young couple can’t afford a home. They take up the offer of rent-free luxury accommodation, with a little pocket-money and a free car too. Is there a catch? You bet. The house is the set for a kind of “paint ball” game taken to almost sickening extremes. This intriguing premise works very well indeed on paper (they provide a free script with the programme – nice). Staged, this is a somewhat over-done event. Audiences are herded into one of four “zones” or “hides” as they turn out to be. Action is then viewed through one-way glass if watching house occupants, live in your “zone” or on video if happening in another zone or out of audience view. So that you miss nothing, audio is via headphones throughout. The result is oddly detaching. 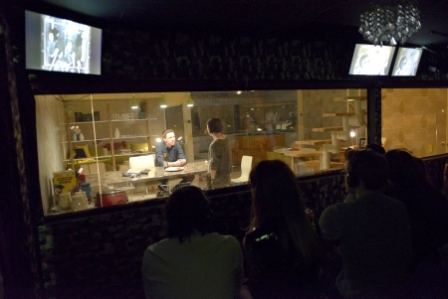 A very human story, minus the live contact theatre usually provides, means a disconnect between cast, audience and material. Indeed, it was noticeable that I wished to engage with one of the actors doing something unspeakable right by my elbow. Normally, “breaking the wall” would be out of the question, but after just 30 minutes, I think I was dying for human contact. The story itself does raise questions. About entertainment and media, about the value of life measured against entertainment, about reducing life itself to a game in search of profit and… just why does a director ask a lady to “prove that she is one” in the crudest way, while leaving a male actor more fully dressed? That was tacky beyond the call of the script. It’s well written, particularly well acted by Jodie McNee (Carly) and Mike Noble (Ashley) as the victims, Kevin Harvey (David) the guard with a conscience and Clare Burt as a person perhaps doing what many stressed parent might wish to – but would never dare. A large cast of assorted players ensure that this is a team effort. Too short to explore the concepts raised really satisfactorily, yet intense enough to leave a mark, this is something I’d like to see in a simplified staging and extended in text at the Donmar or any small fringe venue that has an empty thrust stage, with the subjects on the main level and the rest on that balcony above. It’s also perhaps going to be a great one for final year drama course students to get stuck into as well. Beneath the technology, there’s valid points to be made and, if this staging will go down in theatre history as unique and unrepeatable, the play itself will have a far longer life as something with a fresh voice and a genuinely compelling central idea. Photographs (above) show Jodie McNee and Mike Noble. Photograph credit: Keith Pattison. Used by kind permission of the photographer and Almeida Theatre. I’ll be taking a break for a couple of weeks, back on 21st April. Enjoy the holiday weekend, everyone.